Health is Constructing Buildings and Recruiting Cadres ? The Budget speech by the Finance Minister, Abul Maal Abdul Muhith, on 10th June, 2010, touched upon Health and Family Welfare in the 139th paragraph; it clearly indicates health sector unfortunately is not a priority sector, not even the health service delivery to the people. The neo-liberal paradigm denies that government has responsibility to ensure health service delivery 'free of cost' to the people. The introductory remarks of the Finance Minister were pathetically dry on this vital sector which is important not only for socio-development and purely health concern, but health is also a critical economic factor. Any idea of enhancing economic performance and productivity is directly related to the health of the population of a country. The five miserly paragraphs allocated for health and family welfare in the budget speech focused only on three major categories, i. upgrading of the existing hospitals, ii. construction and iii. recruitment. Besides these three main emphasis, the Minister referred to the pledge to ensure quality health services for all in its last year’s (2009 - 2010) budget, which was fulfilled only through commissioning of 9,525 clinics - under the program for establishing 13,500 Community Clinics (as described in the Election Manifesto). In terms of performance of the government in last 18 months of its taking office, the Minister reported that Maternal Health Voucher Expansion scheme and delivery of services began in 35 upazillas (out of 45 upazillas) and another 17 upazilas have been identified for extension of this scheme. Another performance record is about the coverage of National Nutrition Program to 123 Upazilas to solve malnutrition problems. This program is being implemented at the field level by the NGOs. The government is also taking up population control and reproductive health services by undertaking various programs at a cost of Tk. 213 crore for procurement of contraceptives. The population control programme only means, procurement of contraceptives! The plan to upgrade in phases all upazila to 50 bed and district level to 250-bed hospital as promised in the last year's budget was achieved in upgrading of only 142 upazila hospitals, and 9 district hospitals. This has been a slow progress. 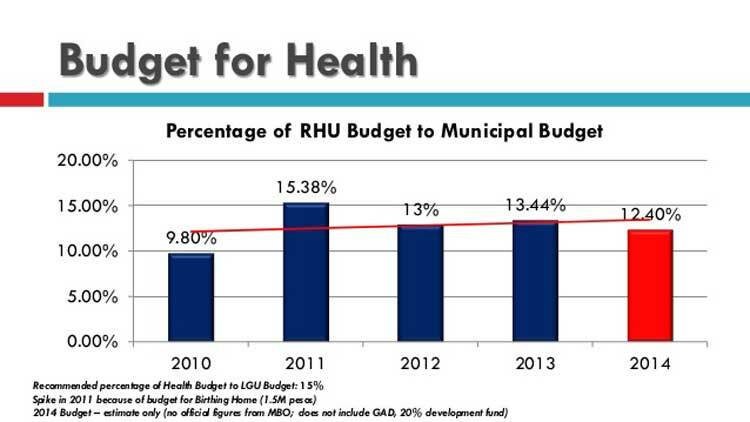 The associated services with the upgrading of the hospitals are not reflected in the budget. The construction work of 5 new Medical colleges and 5 institutes of Health Technology were planned in the last year's budget (2009 - 2010). Three medical colleges have been constructed, two are underway and two Health Technology Institutes have already been built. The remaining work is ongoing. The construction work of 11 nursing institutes out of 12, have been completed. Three nursing institutes out of 6 have already been converted into nursing colleges and the conversion of the remaining 3 is underway. This looks like a budget for the Ministry of Public Works! The recruitment of manpower in different levels of health programmes is seen as the opportunity to fulfill the "pledge of the present Government’s Election Manifesto - creation of employment for at least one member of each family". Since the government has taken office, the Health Ministry has recruited 6,391 Health Assistants, 4,133 doctors on ad-hoc basis and 2,627 nurses under the Directorate of Nursing Services during the current year. Through these a total of 13,151 persons have been employed. There are provisions for employing 14,000 Health Assistants, 13,500 Health Advisors in community clinics and 46,000 persons under National Nutrition Program to provide nutrition related services at the field level. That is, this year's budget will provide employment for 73,151 persons. The Health sector will have to cover the salaries of about 86,302 persons during this fiscal year. The Public Service Commission could have taken care of these recruitments. The other projects are to complete Institute of Tropical and Infectious Diseases, to establish a world class Drug Testing Laboratoryas part of the modernization scheme of the Department of Drug Administration and preparing draft policy on the Patients' Welfare Fund. Finally the proposal for allocation development and non-development combined, for the Ministry of Health and Family Welfare is Tk. 8,149 crore for FY 20010-11, which is 6.2% of the total budget. The allocation for the health sector was Tk 6,998 crore in the budget of 2009 - 2010. The sector gets the 9th priority in the budget. It is also surprising that the maternal health care did not receive any attention in the budget even though it is one of the important goals in MDG. Prof Rashid-e-Mahbub, former president of Bangladesh Medical Association and President of Health Rights Movement National Committee in his response to the budget (11 June the Daily Star) said "Most of the money will be spent on salaries of staffs and the remaining on construction work like establishing community clinics. However, it would not bring any qualitative change to the sector. The government should consider bringing about reforms in the health sector and allocate accordingly". Shasthya Andolon, a network of health activists, has always demanded the appropriate allocation in the health care sector which will ensure primary health care services to the people. The increased or decreased amount of money does not mean anything if it is not allocated for the service delivery. There is no mention of any allocation for regulating the mushrooming private clinics in the capital as well as in the district and upazilla level and the pharmaceutical companies producing sub-standard medicine. The preventive healthcare is totally out of the budget. Finally, the much awaited National Health Policy is not mentioned once in the Budget Speech, although it was also one of the pledges in the Election Manifesto of the present government. The absence of a pro-people health policy is reflected in the present budget, which simply is taking care of the political agenda of the government and not that of peoples' needs.